Comply effortlessly with GDPR and inspire trust from your customers with Vtiger's Privacy Guard extension. Privacy Guard enhances your contacts' data security, lets you easily manage their consents, and automatically processes their GDPR rights requests. GDPR requires that businesses secure their contacts' sensitive data, seek consent to use that data, and provide them with new rights. Vtiger's Privacy Guard extension gives you the tools to comply with requirements effortlessly - from data encryption, to access restriction and obfuscation, to consent management and GDPR rights exercising. These tools work behind the scenes to minimize your risk of non-compliance, and to save your team time that they can focus on growing your business. Encrypt, obfuscate, and control access to data fields you mark as sensitive. Encrypt fields holding sensitive data, such as a national ID number or credit card number. This minimizes their risk of loss to intrusion, reduces potential legal penalties, and lessens legal disclosure requirements in the event of certain losses. Partially obfuscate the default view of sensitive data fields, such as only showing the last 4-digits of a credit card number. Users can still use these fields to verify contacts' identities, without exposing the full value to the risk of misuse. Control which users have permission to un-obfuscate sensitive data fields, minimizing the risk of potential misuse. All attempts to un-obfuscate sensitive data are logged and searchable in the audit tool, facilitating and accelerating investigations into data misuse. Let your contacts control their privacy preferences from their preferences page - accessible in an emailed link. Customize this page to let them control their communication preferences and provide consents for data storage, usage, tracking, and other purposes. Automatically request consent the moment it's needed. This saves your employees time making the request and maximizes your contacts' likelihood of consenting. Contacts can return to their preferences page at any time to change their consents, freeing up your employees up from having to act as an intermediary. Never go looking for a contact's consents. They're all shown directly in the contact's record alongside their other data. Whether it's erasing a piece of sensitive data, sharing data with third parties, or locking a contact's record, workflows and pre-built automations instantly act on a contact's consents, saving your team time doing the work, and your business the risk and cost of non-compliance. You can comply with all of a contact's GDPR rights from any version of Vtiger. However, Vtiger's Privacy Guard extension enables new ways to comply that save you time and preserve useful data. Automate the process of collecting and acting on your contacts' objection to processing. When contacts submit a request from their preferences page, Vtiger will automatically lock records and opt them out of your email campaigns, saving you the time required to take action, and the risk of not complying. Contacts can submit a request for erasure from their preferences page, tagging their record. Users can act on these requests individually, or in bulk, to rapidly erase personally identifying data while keeping other important non-identifying but strategically essential data in tact. 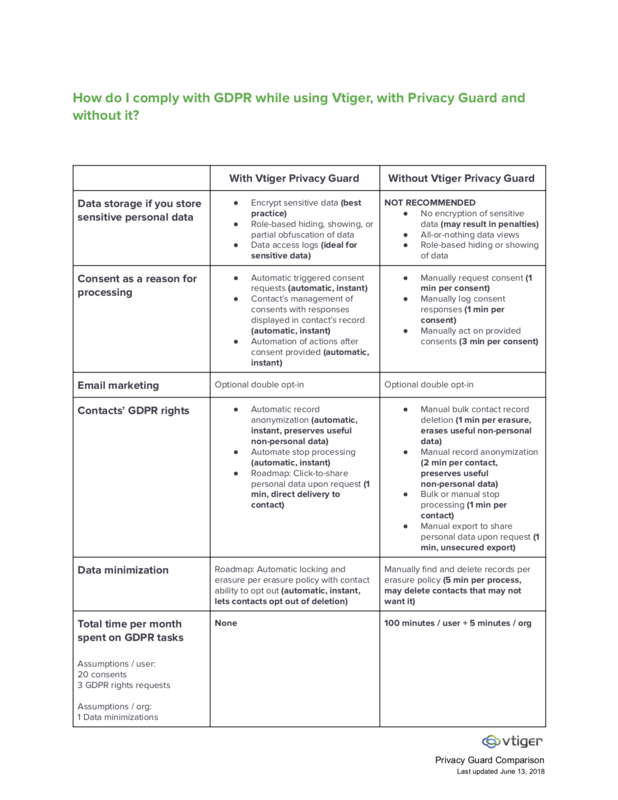 Download the compliance capability comparison chart to learn how complying with GDPR while using Vtiger is easier when you use Privacy Guard, from the new ways it helps you comply, to how it saves you time. Ready to try Privacy Guard?